Increase your tying options with the Smart Tie TetherRing! The TetherRing is a simple and versatile tool - not only does it enhance the function of The Clip by giving you more tying options, The TetherRing has many other uses. 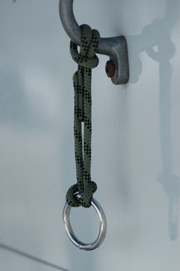 Strong and durable, The TetherRing is designed to hold a horse to a high line and not slide. Can’t find anywhere to Clip your horse? Just wrap a TetherRing around a fence post or tree and Clip! Use it to hang your water buckets and hay bags and to keep your tack room organized. Manage your garden hoses, cables and ropes. Utilize it anywhere ~ the barn, garage or basement ~ wherever you need to keep things neat and orderly! Once you experience the utility of these little gems we're confident you'll be back for more.